Get a free excerpt from Capitalists Arise! Sign up to the newsletter and instantly get the free excerpt from Capitalists Arise! Peter Georgescu arrived in this country as a penniless Romanian refugee and rose to become the CEO of Young & Rubicam. Which is why he’s so heartsick that in America today, with flat wages, disappearing jobs, and a shrinking middle class, his kind of rags-to-riches story doesn’t seem possible now. But he has a message for his fellow CEOs: we’re the ones who must take the lead in fixing the economy. Marshaling deeply sobering statistics, Georgescu depicts the stark reality of America today: a nation with greater wealth inequality and lower social mobility than just about any other country in the developed world. But the problem isn’t that free-market capitalism no longer works—it’s that it’s been hijacked by shareholder primacy. Where once our business leaders looked to the needs and interests of a variety of stakeholders—employees, community members, the business itself—now they’re myopically focused on maximizing their shareholders’ returns and nothing else. Capitalists Arise! shows how the short-term thinking spawned by shareholder primacy lies at the root of our current economic malaise and social breakdown. But Georgescu offers concrete actions that capitalists themselves can take to create a better future—pay a fair wage, build up the business instead of just the stock price, and more. The irony is that if businesses do this, shareholders will do even better. In the long run, businesses can thrive only when society is healthy and strong. This book is a manifesto calling on capitalists to heal the nation that has given them so much. Capitalists, Arise! 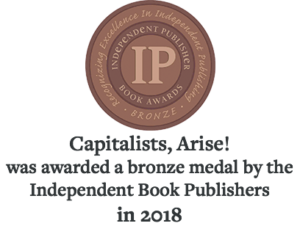 was awarded a bronze medal by the Independent Book Publishers in 2018. Peter Georgescu is a great storyteller. In his new book he takes on one of the driving stories of our time – income inequality. He makes you not just understand but feel the consequences in human terms. And then he goes on to offer real world solutions. This book will not just make you think; it will drive you to action. In this valuable and well written book, Peter Georgescu explores the erosion of the American Dream and the societal impacts of growing economic inequality. Fortunately, he is an optimist and presents a compelling case for what the private sector can do to simultaneously advance the interests of both workers and shareholders. Unlike many books about the future of our economy, this is one you should buy – AND ACTUALLY READ. 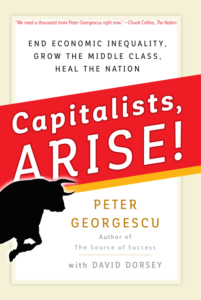 In Capitalists Arise, Peter Georgescu has issued a challenge to America’s captains of business, industry and finance to step forward and reclaim capitalism as a means of creating wealth and shared prosperity. Capitalists Arise is a clarion call by a great American patriot and business leader written out of love for his country and his unwavering belief in our nation’s ideals of fairness, opportunity and justice. Peter Georgescu has written a clear-eyed assessment about the drivers of key national challenges like income inequality and shrinking economic opportunity. He offers a number of thoughtful prescriptions for change, all aimed at the worthiest of goals – restoring the viability of the American Dream. I applaud and commend his efforts.